There is a good chance you are reading this right now on a mobile device. Mobile learning continue to gain popularity in the business world as device capability improves and more critical learning content become 'digitized' for multi-platform deployment. 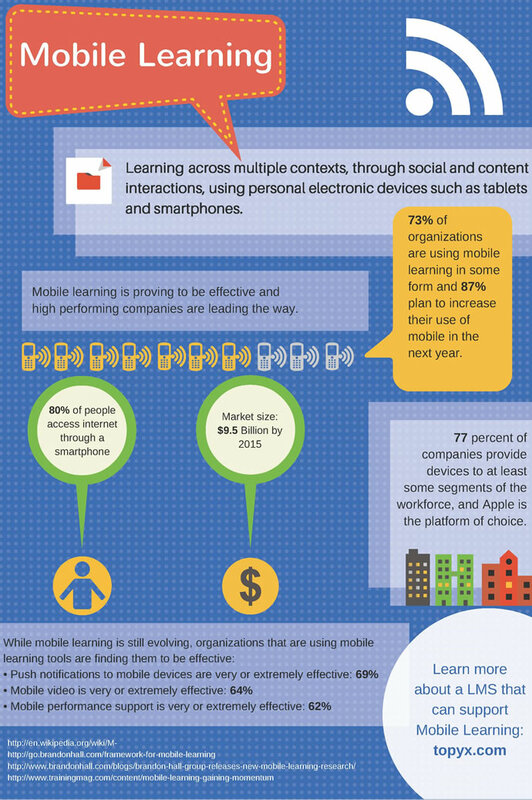 Mobile learning is here to stay. Is your organization making the most of it? One way to leap into the mobile learning pool is to deploy a learning management system that can be accessed by many different devices. It is important to support different devices as the BYOD (Bring Your Own Device) perspective companies are taking gains momentum. There are many different LMS options out there, so make sure you test out the mobile access and content deployment you need for your employees to get at the critical content they need, when they need it, wherever they may be. One option to look at is the TOPYX learning management system which offers mobile learning as a standard features of their software offering. Employees do not want to be chained to desks (and desktops). Having access to information on the run will continue to help the top performers succeed. If you have not made mobile learning a priority, now is the time to make a move with the tools that are available today.